Research shows that barriers to education, parental aspirations, and societal norms are similar across the world and do not change that dramatically—whether you are in West Africa or South Asia. Another Option has been working in early grade reading for four years in Africa and Asia under several USAID-funded awards. 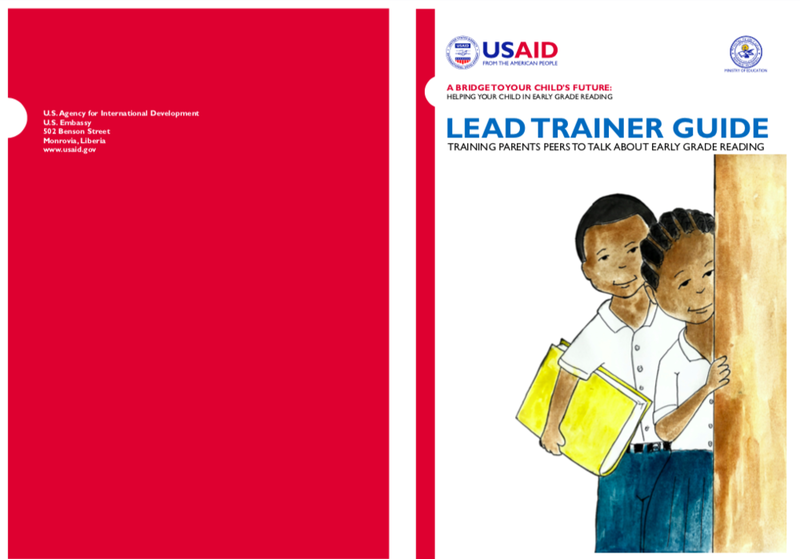 As part of the USAID Read Liberia project, our technical experts have just published two guides for peer educators and lead trainers working across Liberia to promote early grade reading. These guides were vetted through a series of focus groups to ensure that they were relevant to parents and caregivers in urban and rural communities across Liberia. One major component of making the two documents accessible to Liberian parents and caregivers were illustrations by local artist Brima Wolobah which show real life situations that parents can use to talk about reading with their peers or support their child’s learning. These materials are available for download and may be adapted for use with attribution, under Creative Commons Attribution. Specific requirements for reuse can be found within each document. June kicked-off with the expansion of USAID’s Early Grade Reading Program in Nepal into ten new districts in the country. Another Option brought together 94 recently designated regional mobilization officers and representatives from ten community-based organizations for a ten-day training on promoting key behaviors for peer networks of parents to promote early grade reading. Prabodh Acharya and Sangeeta Lama, Another Option’s technical leads in Nepal, conducted the orientation using the Peer Education Interpersonal Communication Module. The training guide, created previously by Another Option for this project, orients parents to key behaviors they can adapt in their home and community to promote early grade reading. These behaviors range from setting aside ten minutes a day for a child to read out loud, to preparing a special place for the child to study in the home. The training also encourages parents to strengthen their relationships with their children’s teachers through active participation in parent-teacher meetings and dialogues. Previous graduates of the Another Option peer training attended this workshop to share their experiences implementing lessons learned and to encourage the newest trainees to utilize the training in their daily interactions not only with community members, but also within their own children’s lives. At the end of the workshop, each newly trained organization received a copy of the Peer Education Interpersonal Communication Guide, a poster with key behaviors and prompt cards to initiate dialogues with parents around early grade reading.